NOTE: Room is based on 2 Single Beds. Bonus: 1 FREE night for travel until 31 Mar 19 (already included in the price). On the slopes of Mt. Parnassus, Delphi is home to the archaeological site of the Sanctuary of Apollo, Treasury of the Athenians and museums. Enjoy lunch before a visit to the village of Arachova. Walk through the city to see the Acropolis, Temple of Nike, Parthenon, House of Parliament, Monument of the Unknown Soldier, National Gardens, Zappeion Hall, Temple of Olympian Zeus and the Hadrian’s Arch. Take an open, double deck bus tour of Athens. 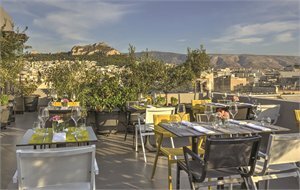 Visit the many iconic attractions including the Acropolis and the Parthenon. 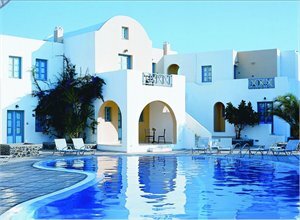 Hotel El Greco is situated in the heart of Santorini, only minutes from Fira and offers a peaceful setting. 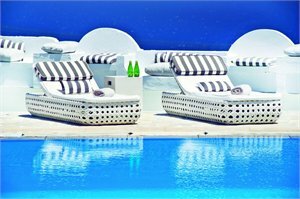 The property boasts five outdoor pools, an indoor and children’s pool, making it the ideal place for families and couples. PACKAGE TERMS & CONDITIONS: It is our policy to present the cost of our holidays inclusive of all airport and government charges. Please accept however that these charges are not within our control, therefore we reserve the right to pass on any increase.. Travel agent professional service fees where charged, will be additional to the advertised prices. Closeout and blackout periods apply over school holidays and peak holiday periods & availability of seats & rooms is likely to be very limited over this time . Valid for sales to 31 May 2019. Valid for travel commenced on or after 19 Feb 2019 (unless otherwise specified).Accommodation Surcharges apply during Trade Fair periods. A City Tax applies and is paid direct to the hotel. Please note there is limited availability on the advertised room types and all pricing is subject to change until a reservation is confirmed. Inventory & availability can change on a daily basis. Strictly subject to availability for all components. Please enquire for an up to date price at the time of booking. Prices shown are based on per person costs in New Zealand Dollars, for payment by cash, cheque or eftpos only. Credit card sales not permitted unless Travel Agent acts as a merchant. Strict cancellation fees apply. Packages are based on consecutive nights. For split stays please contact your travel consultant. For full terms and conditions and cancellation fees please contact your local travel agent for more information.